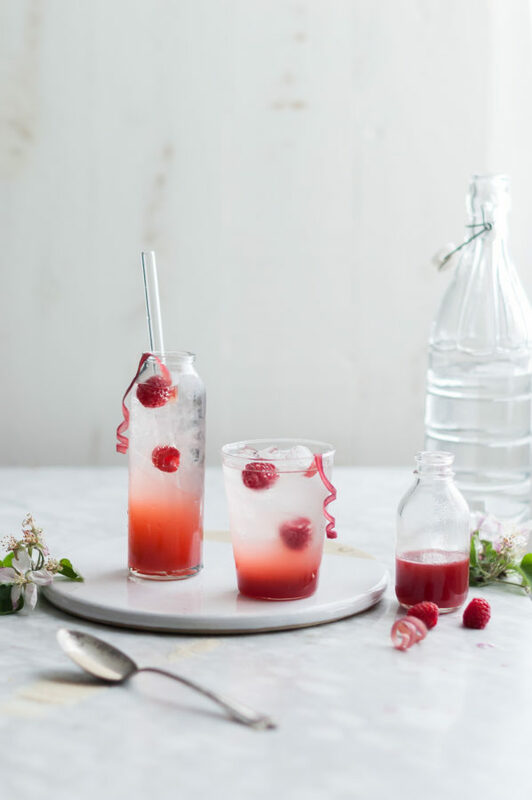 As someone with a huge obsession with lemonade, I was more than thrilled to recently discover shrubs. I don’t drink alcohol, but I love myself a good, icy drink full of fruity flavors and a little tang. I don’t care for overly sweet drinks, but as I said, lemonades as well as kefir water and kombucha are my favorites. I’m a firm believer in adding some amount of acid to most drinks or dishes to balance them out. I’ve made a good amount of lemonades for this blog and was looking for a little change of pace this year. Enter: THE SHRUB. I know, bit of a funny name. I can’t even tell you how many times I’ve referenced TLC this last week. It’s embarrassing. My husband is guilty of it too. We pretty much traipse around our house all day, sipping shrubs and singing “Yes, I want a shrub. 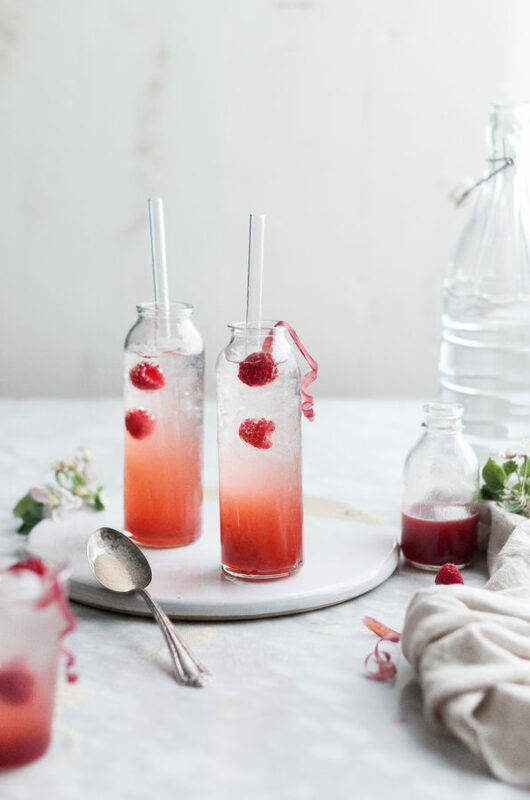 A shrub is a drink that gets so much love from me”. So shameful. This is the result of being a teenager during the late 90’s. I can distinctly remember sitting in the passenger seat of my husband’s (then boyfriend’s – we dated in high school) white jeep, windows rolled down, singing TLC’s Scrubs at the top of my lungs with my husband-then-boyfriend drumming loudly on the steering wheel wearing his jnco’s, puka-shell necklace, and long highlighted hair. Yes, TLC’s Scrubs has a place in my history, but more importantly: Shrubs now have a place in my stomach (read: heart). This is a strange post. I realize and apologize for that. Also, I have to wonder how many blog posts about shrubs involve TLC refrences. A fair amount, I would guess. Sorry about that, friends! Moving on…..maybe we should actually discuss shrubs and what they are, hmmm? A shrub is basically drinking vinegar. Fruit and sugar are muddled together and left to sit in the fridge for a few days, in which, a syrup results. The solids are strained out, the remaining syrup is mixed with vinegar (I like to use raw apple cider vinegar as it poses the most health benefits) and the mixture is jarred and refrigerated again for the space of several days. In this time, the sharp, harsh notes in the vinegar mellow out and the most beautiful , brightly fruit flavored simple syrup results. The syrup is mixed with sparkling or mineral water for the most refreshing drink you ever did taste. I literally cannot get enough of their sweet fruit flavor and tangy bubbles. 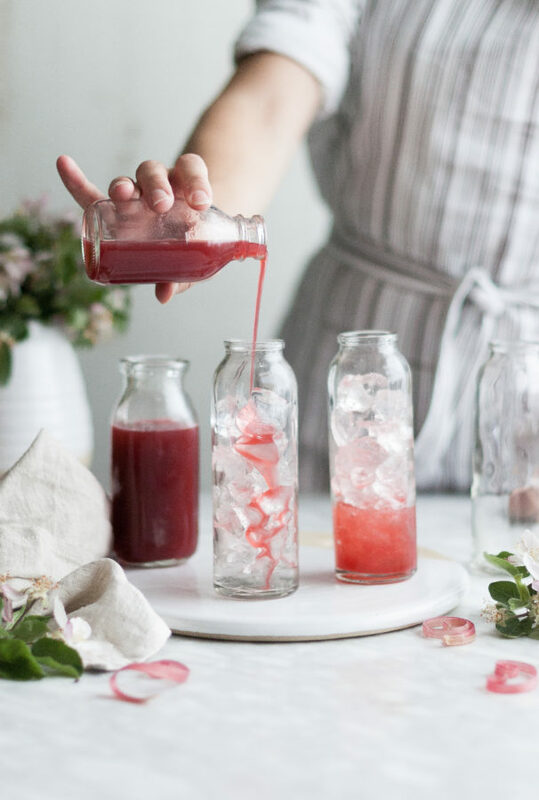 If you love the vinegar-y taste of Kombucha, shrubs should be right up your alley. I love them even more than kombucha because they are a bit sweeter and aren’t as much of an acquired taste. 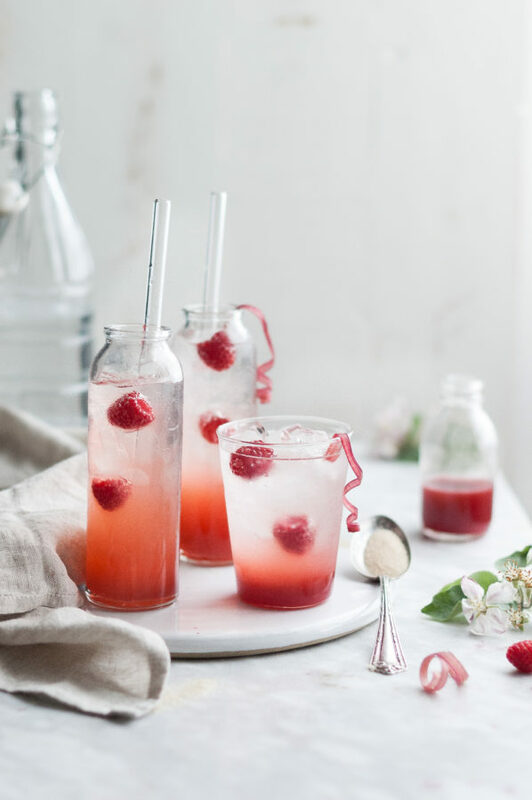 Shrubs are a refreshing break from flavored lemonades, with all of the same elements: fruit, acid, water. Raw Apple Cider Vinegar boasts a slew of health benefits and is recommended to be consumed on a daily basis. Some of the benefits include the balancing of PH levels, overall body detoxification, cleansing your lymphatic system, clearing sinuses, lowering cholesterol, and many others. I’m going to take this as an excuse to drink shrubs daily. Clearly it’s for my own good. 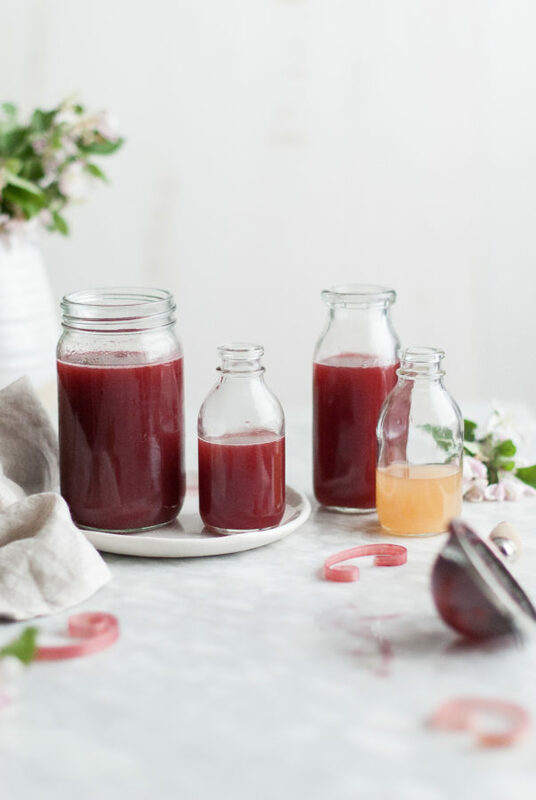 You can use all cane sugar or even turbinado or demerara sugar to make the fruit syrup. I like a mixture of raw cane sugar and raw honey for my syrups. I don’t care for the flavor of all honey, but a half and half combination results in the nicest of flavors. 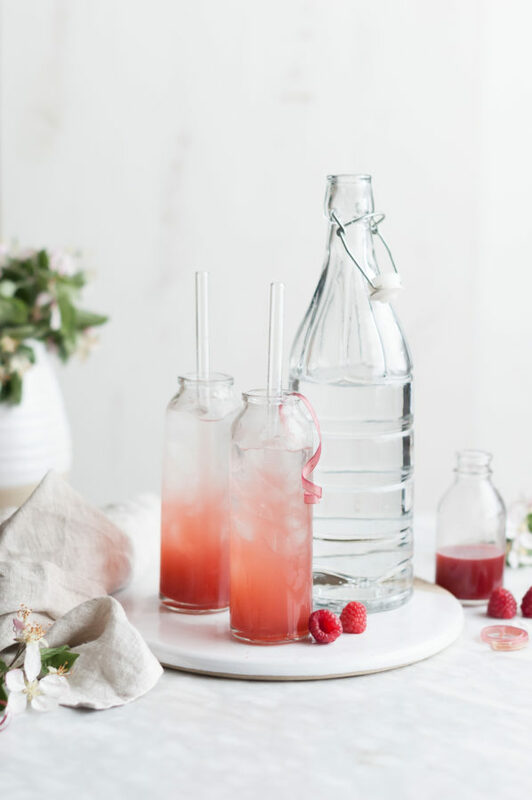 The honey and the rose add a floral earthy balance to the sharper, more tangy notes let on by the rhubarb and raspberries. 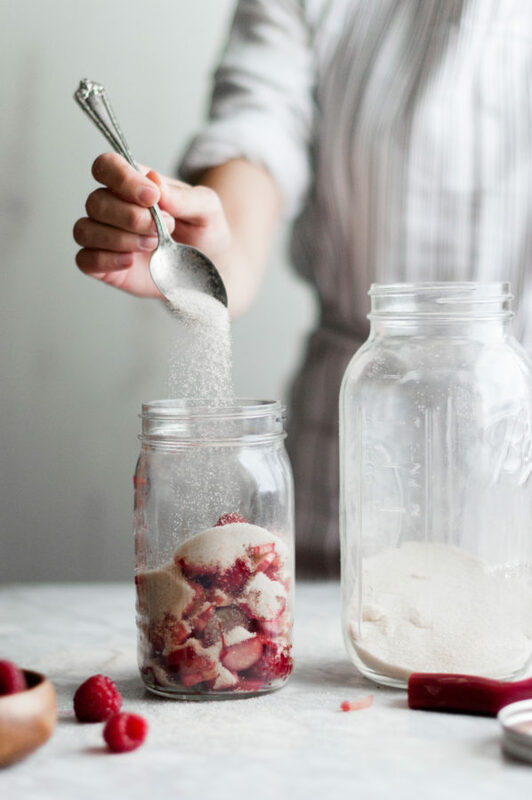 Once you’ve combined the sugar and fruit and a syrup has developed, you can simply strain it out as is and discard the solids. I like to puree the whole mixture in a blender and then run it through a fine mesh strainer as more of the fruit pulp is extracted, thus adding even more flavor to the syrup. 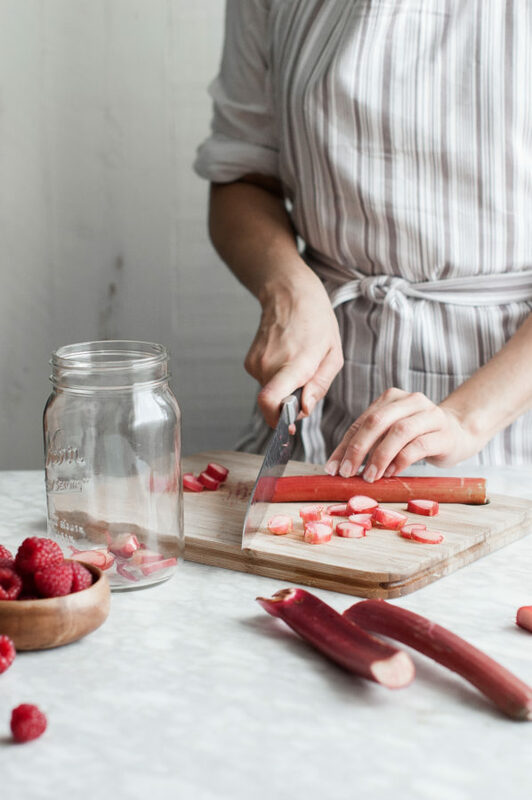 Find the thinnest, pinkest stalks of rhubarb you can. These will impart the best flavor and color to your syrup and the slices of rhubarb will break down easier, as they are more tender. 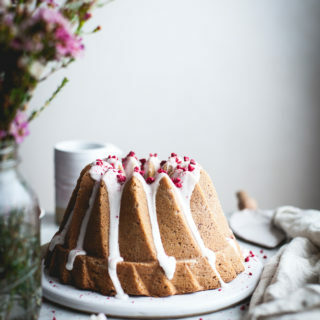 Don’t skip the rose in this recipe! I mean, you’ll still have a great tasting drink without it but the rose really makes this drink something special. I like to use rose oil because one tiny bottle of it will probably never run out so I always have it on hand. Seriously. This recipe needs one drop of rose oil (make sure it’s food grade) and most other recipes don’t even need that. If you can’t get your hands on rose oil, rosewater will work beautifully in it’s place. 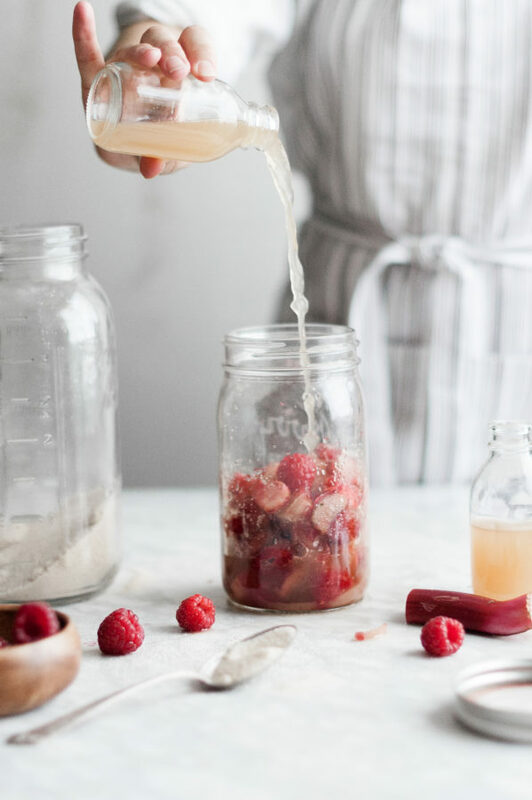 This combo of raspberries, rhubarb, and rose may be one of my all time favorites but I have a feeling that this summer will bring endless flavor combinations and shrub-praising blog posts your way. I’ve a blackberry/lavender syrup and a strawberry/rhubarb syrup hanging out in the fridge as we speak. I also just ordered a gallon of raw apple cider vinegar and I’m hoping it will be enough to last me the next month. Or at the rate I’m drinking these, week. I’ve included two different syrup-making methods in the recipe. 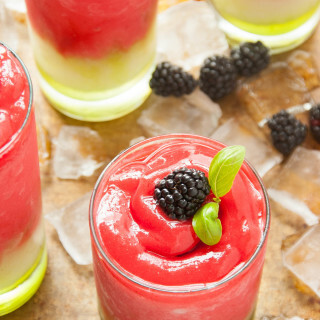 The long method will take a few more days than the short, but you’ll be left with truer flavors as the fruit juices remain brightly flavored and intact. The short method is for those who want a shrub like, now. The flavors are still lovely, albeit not as fresh and bright as those that result from the long method. I’ve made both and both are swoon-worthy. 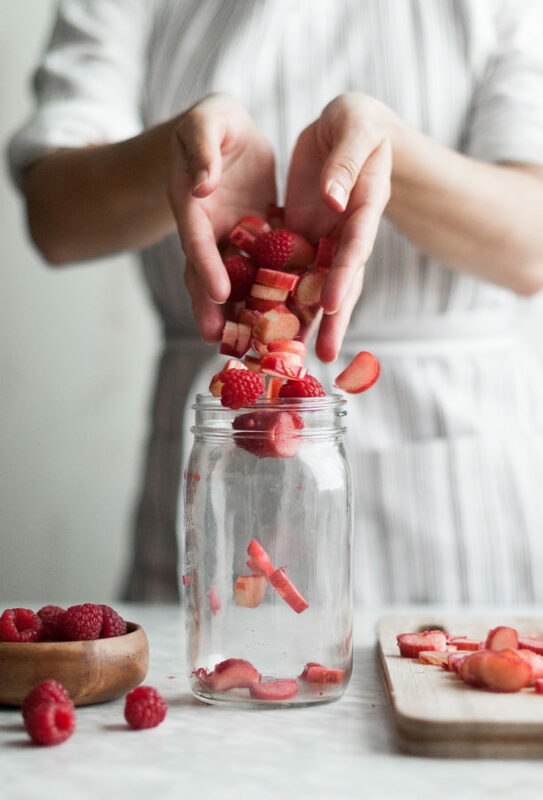 Place the raspberries and rhubarb in a jar. 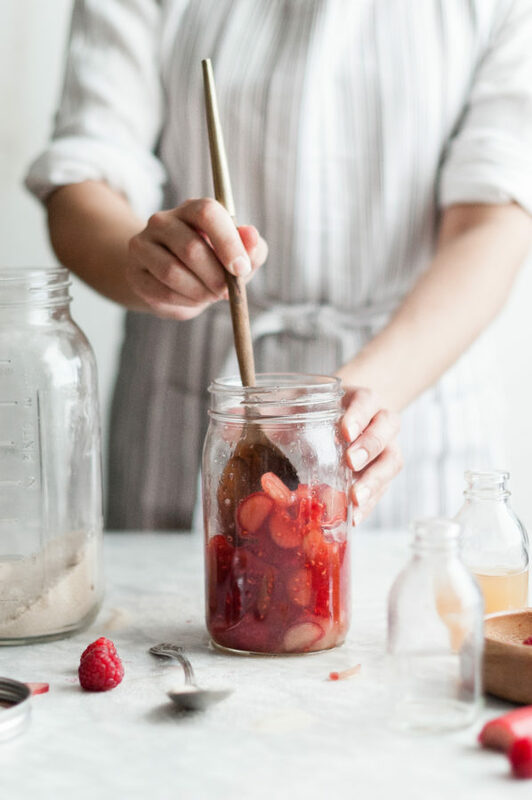 Add the sugar and mash in with the berries using a muddler or wooden spoon. Place in the fridge and let sit for 2 days, shaking occasionally to help dissolve sugars. 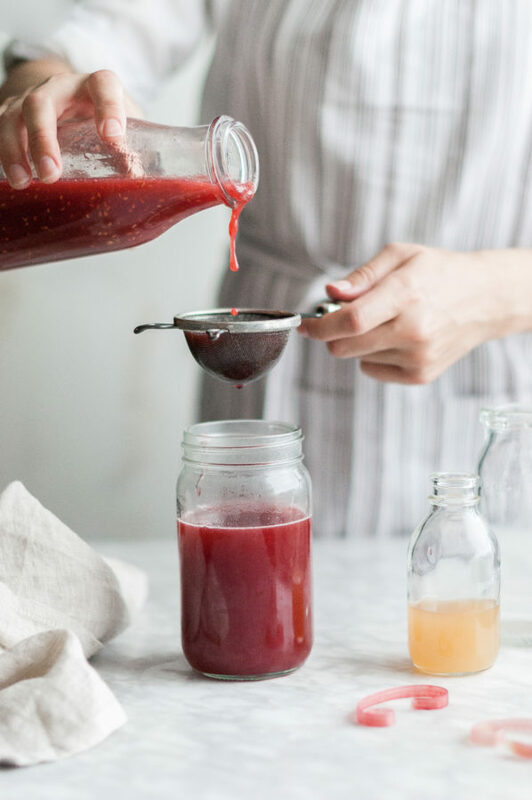 After two days, pour the mixture into a fine mesh sieve, pressing on the solids to strain out the fruit syrup (alternatively, you can blend the whole mixture and then strain it through a sieve to get the most fruit and flavor out of it). Place the syrup back in a jar and mix with the honey, rose oil(or water) and vinegar. Place back in the fridge for 5-7 days. Shake syrup before using. 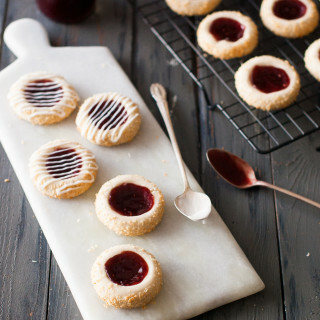 Place the rhubarb and sugar in a saucepan, along with ½ cup of water. Bring to a simmer, stirring to dissolve sugar. Once the sugar is dissolved, remove from heat and let cool completely. 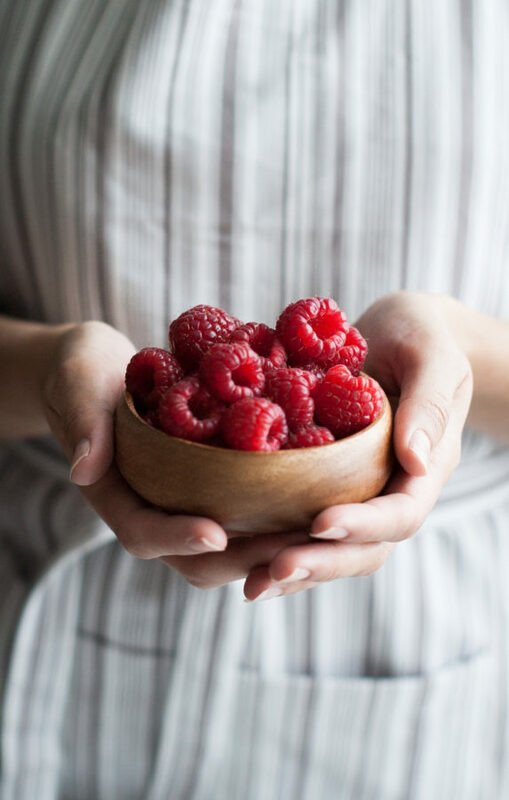 Pour mixture into a blender, along with the raspberries, honey, rose oil(or water) and vinegar. Blend until smooth. Run the mixture through a fine mesh sieve and discard solids. Place the syrup in a container and refrigerate for 5-7 days (or it can be used immediately). 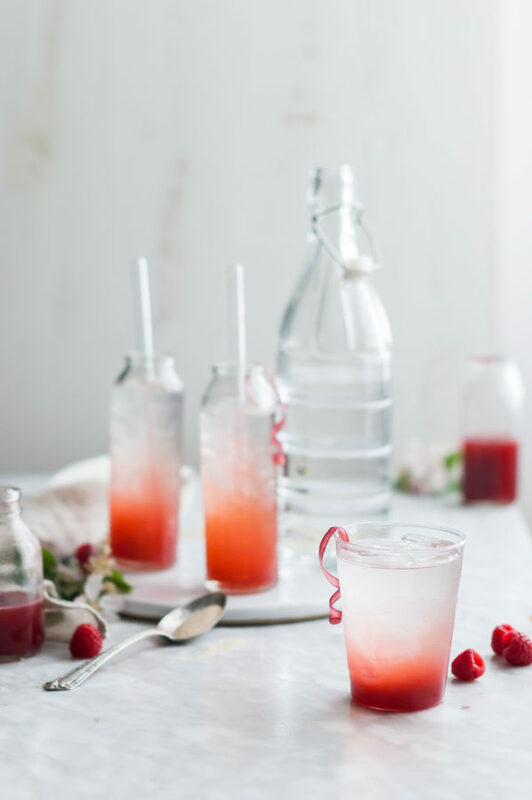 Mix 1 part syrup to 4 parts sparkling water and pour over ice. You may like more or less syrup, depending on your preferences.